I've mentioned before that I love Amy Gibson of Stitchery Dickory Dock. As part of the launch for her book, For Keeps: Meaningful Patchwork for Everyday Living, Amy has created the For Keeps pledge, which you can see here. 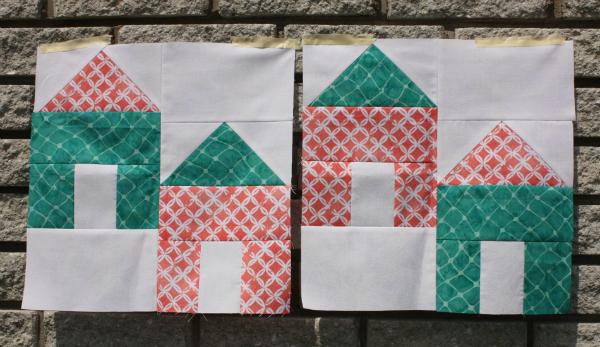 Those who take the pledge are given a free pattern for an adorable house block, along with the option of making blocks to send to Amy, who will make quilts from all the donated blocks. The quilts will then be donated to an organization that gives quilts to local victims of crime and trauma - the same organization where Amy first learned to sew. Isn't that wonderful? Amy asked for blocks in either navy and mustard or coral and aqua, using all unwashed fabric. I prewash all of my fabric, so that meant I had to go buy a couple of new fabrics rather than using what I already had. Oh, the sacrifices we make, right? As you can see, I went with the coral and aqua combo and I love how bright and cheerful these houses look. All of these fabrics are from Connecting Threads. I've ordered from them a few times now and I'm always pleased with their fabric, and their reasonable shipping to Canada. No affiliation here, either, just letting you know they're well worth checking out. These blocks will be in the mail to Amy today. I can't wait to see the quilts she makes with all the donated blocks! What lovely blocks and an awesome donation quilt they will contribute to! Sweet blocks Leanne and for a great cause.